Dongre comes from a traditional Sindhi family and hails from Bandra, Mumbai and has studied designing from SNDT, Juhu and Bcom from Narsee Monjee after which she worked as an in-house designer for export firms for two years. Then she, and her younger sister Meena Sehra, set up two sewing machines in the balcony of their house, and started supplying clothes to a boutique called Saks, which was frequented by Bollywood stars. Dongre made a line of 12 linen dresses and showed it to Saks, who agreed to sell them. Over the weekend, nine of them were sold. The next day she got a call saying they wanted more! That’s how Anita Dongre’s career began in the fashion industry. She was recently ranked in Fortune India’s list of 50 Most Powerful Women in Business 2013. You name the celebrity and they have all been adorned by her! Her clientele include Dia Mirza, Sonakshi Sinha, Urmila Matondkar, Neha Dhupia, Eesha Koppikhar, Shraddha Kapoor, Sonam Kapoor just to name a few. Her designs are so different from the other designers like Manish Malhotra (famous for his wide range of color palette) or Sabyasachi Mukherjee (best known for his colorful embroidery and borders) or Tarun Tahiliani (lehengas filled with heavy gold embroidery). If you have a close look at most of her outfits, they don’t have any traditional embroidery – the main reason why, when she decided to label her creations long time ago, she was bluntly rejected just for the fact that she only used fabric and gota on her designs without any embroidery. AND, Global Desi (its ethnic counterpart), Anita Dongre iinter-pret and Anita Dongre Timeless are all being taken care by Dongre’s family – her brother Mukesh is the CEO and sister Sehra manages production. You don’t need to be Indian to wear these 🙂 Am sure you’d look as gorgeous as anyone else in these dresses during your wedding! 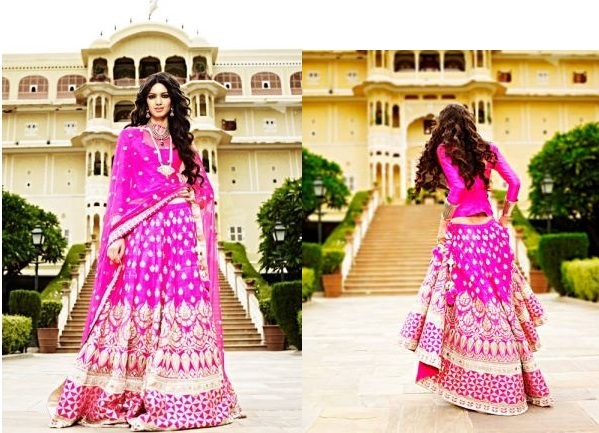 Waaaaaaoooowww truly fab collections ANITA u rock….! !